These limited-edition Magnum creations have been crafted with finesse for the connoisseur’s palate, accessorized with fashion-infused exotic toppings, with a decadent touch of flavour by our Craftsman, Pooja Dhingra.With her eye for detail and the Magnum tradition of exquisite craftsmanship, these creations are bound to turn the balmy summer into a decadent affair. These delectable masterpieces bring alive some of the most iconic fashion looks sported by Sonam Kapoor, Lisa Haydon, Neha Dhupia and Masaba Gupta in a format that’s a feast for the eyes and the taste buds. 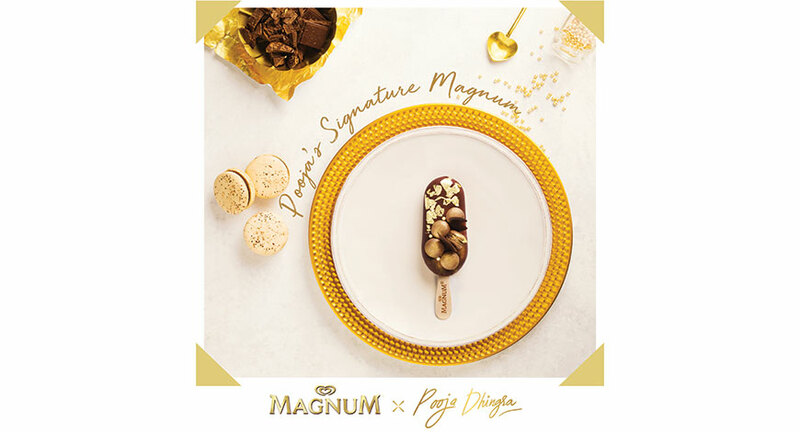 Magnum, being the first premium ice-cream brand designed for adults, will indulge every dessert aficionado and fashionista’s desire through the Magnum X Pooja Dhingra collaboration. Speaking about the collaboration Himanshu Kanwar, Head - Ice cream, India, Hindustan Unilever Limited, said, “Every Magnum is expertly crafted with high-quality ingredients to deliver an exquisite experience to our consumers. Craftsmanship is the epicentre of Magnum’s campaign narrative this year whereby we are inspiring consumers to Take Pleasure Seriously. Pooja Dhingra made for the most obvious choice for a collaborator owing to her skill as a Patisserie craftsman. We hope that this dream collaboration, that will bring the passion & pleasure of flavours to the table, will also inspire our consumers to indulge in a footloose pleasure pursuit.